Crude oil futures rose on Monday as geopolitical tensions over the disappearance of a prominent Saudi journalist stoked worries about supply, although concerns about the long-term outlook for demand dragged on prices. Crude markets were also supported in the wake of data that showed South Korea did not import any oil from Iran in September for the first time in six years, before U.S. sanctions against the Middle Eastern country take effect in November. Brent crude had risen $1.01, or 1.26 percent, to 81.44 a barrel by 0424 GMT, on track for its biggest daily gain since Oct. 9. 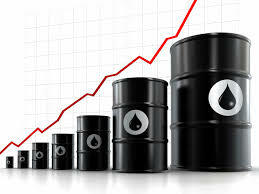 U.S. crude futures climbed 80 cents, or 1.12 percent, to $72.14 a barrel, extending gains they racked up on Friday after hefty losses on Wednesday and Thursday. “The market has again expressed concerns over geopolitical tensions in the Middle East after U.S. and Saudi traded comments over the disappearance of the Saudi journalist, leading to a jump in prices,” Wang Xiao, head of crude research with Guotai Junan Futures, wrote in a research note. Saudi Arabia has been under pressure since Jamal Khashoggi, a prominent critic of Riyadh and a U.S. resident, disappeared on Oct. 2 after visiting the Saudi consulate in Istanbul. The kingdom would retaliate against possible economic sanctions taken by other states over the case, its state news agency SPA reported on Sunday quoting an official source. “South Korea’s move to stop Iran oil imports is giving the market confidence on prices,” said Chen Kai, head of research at brokerage Shengda Futures. Lingering geopolitical worries, trade concerns and a weaker economic outlook may pave the way for another week of volatile trading, Chen said, adding that Monday’s recovery in prices was “fragile”. Putting downward pressure on oil prices, the International Energy Agency, the West’s energy watchdog, said in its monthly report that the market looked “adequately supplied for now” and trimmed its forecasts for world oil demand growth this year and next. That comes after the secretary general of the Organization of the Petroleum Exporting Countries (OPEC) last week said the group sees the oil market as well supplied and that it was wary of creating a glut next year.